GOLD AND BLACK ILLUSTRATED VOLUME 28, ISSUE 6 3 Gold and Black Illustrated is published to be delivered by mail every month (bi-monthly) in late August, October, December, February, April and June. Periodicals postage paid at Lafayette, Ind., and additional offices. Known office of publication is 2605 Yeager Road, West Lafayette, IN 47906. GOLD AND BLACK ILLUSTRATED (USPS 010-447). Subscription rates: $57.95 ($62.05 for Indiana subscribers). Foreign rates: Available upon request. 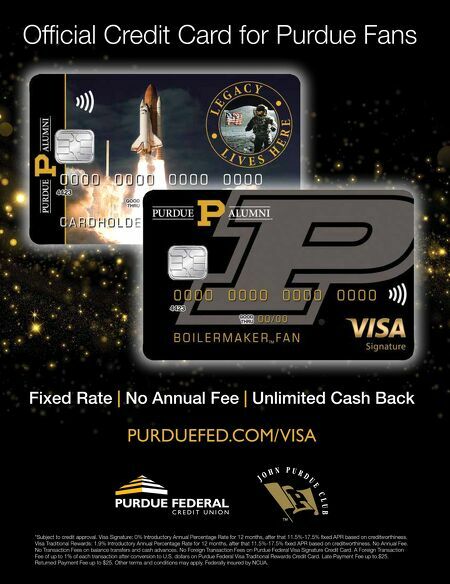 POSTMASTER: Send change of address form to: Gold and Black Illustrated, 2605 Yeager Road West Lafayette, IN 47906. Publisher assumes no responsibility for unsolicited manuscripts and photographs. All letters to Gold and Black Illustrated will be treated as intended for publication and are subject to Gold and Black Illustrated's right to edit and comment editorially. The Boilers, Inc. officers, shareholder, staff and contributors are not and never have been sanctioned by Purdue University. The views expressed do not represent those of Purdue or its employees. 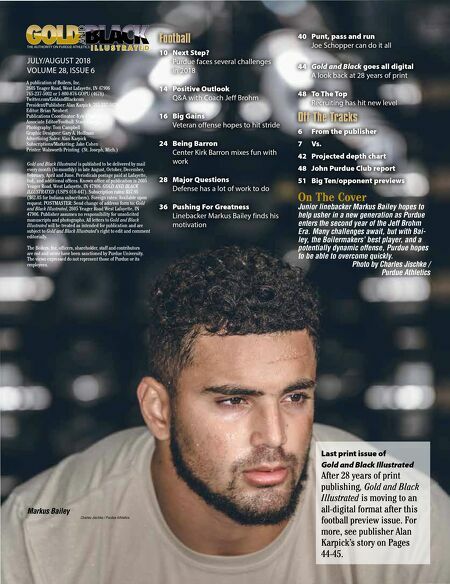 JULY/AUGUST 2018 VOLUME 28, ISSUE 6 On The Cover Junior linebacker Markus Bailey hopes to help usher in a new generation as Purdue enters the second year of the Jeff Brohm Era. Many challenges await, but with Bai- ley, the Boilermakers' best player, and a potentially dynamic offense, Purdue hopes to be able to overcome quickly. Photo by Charles Jischke / Purdue Athletics A publication of Boilers, Inc. 2605 Yeager Road, West Lafayette, IN 47906 765-237-5002 or 1-800-876-GOPU (4678) Twitter.com/GoldandBlackcom President/Publisher: Alan Karpick, 765-237-5078 Editor: Brian Neubert Publications Coordinator: Kyle Charters Associate Editor/Football: Stacy Clardie Photography: Tom Campbell Graphic Designer: Gary A. Hoffman Advertising Sales: Alan Karpick Subscriptions/Marketing: Jake Cohen Printer: Walsworth Printing (St. Joseph, Mich.) Football 10 Next Step? Purdue faces several challenges in 2018 14 Positive Outlook Q&A with Coach Jeff Brohm 16 Big Gains Veteran offense hopes to hit stride 24 Being Barron Center Kirk Barron mixes fun with work 28 Major Questions Defense has a lot of work to do 36 Pushing For Greatness Linebacker Markus Bailey finds his motivation 40 Punt, pass and run Joe Schopper can do it all 44 Gold and Black goes all digital A look back at 28 years of print 48 To The Top Recruiting has hit new level Off The Tracks 6 From the publisher 7 Vs. 42 Projected depth chart 48 John Purdue Club report 51 Big Ten/opponent previews Markus Bailey Charles Jischke / Purdue Athletics Last print issue of Gold and Black Illustrated After 28 years of print publishing, Gold and Black Illustrated is moving to an all-digital format after this football preview issue. For more, see publisher Alan Karpick's story on Pages 44-45.